By 1000 AD, the invading Lombards had married local rich men and women of Italy and mixed their families together. A few rich families – part Lombard and part Roman – ruled most of northern Italy as small independent countries. Supposedly these countries were part of the Holy Roman Empire, but really they did pretty much whatever they wanted to. The biggest of these countries was Canossa, and in 1000 AD Boniface III was the Count of Canossa. Count Boniface ruled not just Canossa itself, but also many other cities of northern Italy including Genoa, Florence, and Pisa. Romanesque baptistery in Florence, Italy, built about 1100 AD, under the rule of Matilda of Canossa. When Boniface was killed, his son Frederick inherited his country, but Frederick also died soon afterwards and left the country to his sister, Matilda, who was only eight years old. Matilda’s stepfather ruled for her. He forced Matilda to marry her stepbrother Godfrey when she was about 25 years old, but when her stepfather, mother, and husband all died soon afterwards, Matilda (now 30 years old) ruled her lands alone. That was in 1076 AD. Matilda took power in the middle of a big fight between the Holy Roman Emperor, Henry, and the Pope over who should have more power. Matilda took the Pope’s side, and succeeded in fighting Henry off in several battles (though she lost some battles too). 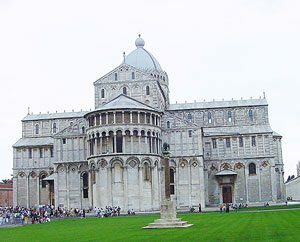 Cathedral of Pisa (the Duomo) – started in 1063 and finished in 1118, three years after Matilda died. Under Matilda’s rule, northern Italy was very well off. 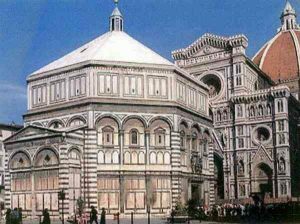 In Florence, they built the Romanesque baptistery. In Pisa, they built a new cathedral. They paid for these buildings with the profits from trade with Fatimid Egypt, on the other side of the Mediterranean Sea. They got rich buying silk, paper, steel, cotton, and sugar from the Fatimids and selling them to Europeans. These new buildings took a lot of ideas from Fatimid buildings, too. What happened after Matilda of Canossa died? Matilda of Canossa married again about 1090 (when she was 44 years old and maybe didn’t have to worry about pregnancy anymore), to Welf V, who also supported the Pope. She continued to rule her lands, until she died of gout in 1115, when she was nearly 70 years old. When she died, many of the cities she had ruled became independent – this was the beginning of the independence of Florence, Pisa, Genoa, and many other cities in northern Italy. Cite this page: Carr, K.E. 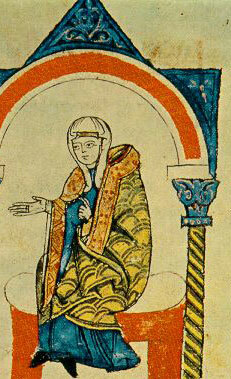 Matilda of Canossa – Medieval Europe. Quatr.us Study Guides, August 2, 2017. Web. April 20, 2019.